We all have some idea of what a resolution is, but what are these scene and story-enders meant to do? In this episode, I explore scene and story resolutions in the context of C. Gabriel Wright’s LBGTQ love story, “Someone.” The editorial mission encourages you to collect resolutions by reading and watching stories—and from your own life. I’m pleased to share that Writership has been included in the Write Life’s list of 100 Best Websites for Writers in 2019. I feel honored to be included and hope you’ll check it out and take advantage of the amazing collection of resources they have gathered there. Speaking of the website, I’ve begun a new series on the Captain’s Blog that you may want to check out. I focus on scene work here on the podcast, and writing a scene that works is a vital skill. But even if you execute solid scene after solid scene, your story could still leave readers feeling unsatisfied for several possible reasons—and they might not be able to tell you why. To support your writing in 2019, the Captain’s Blog will feature a new weekly series on story-level craft to help you focus on the big picture. Click here to read the first post in the series. Final announcement for today: If you could use some help staying accountable with your work in progress and a place to ask questions and celebrate your successes, considering joining the Writership Podcast Slack Community. Click here to find out more. It's easy to imagine Mr. McKee, master screenwriter and author, with a cheeky smile on his face as he wrote that line. And, it’s true, but thankfully he goes on to explain what your resolution should do and what it might contain. Of course the general purpose of the Resolution, whether it’s in your scene or story, is to wrap things up, but we need to get more specific if we're going write effective resolutions. And they often get short shrift. The Resolution is one of the Five Commandments of Storytelling, so before we dive into this discussion, here’s a quick recap of what they are and how they’re connected: Commandment is a term that can rub folks the wrong way, but what we really mean is that these are principles of dramatic structure, described by Aristotle with elements further refined by people like Gustav Freytag, Robert McKee, and Shawn Coyne. Shawn has also made the connection to the Kubler-Ross change curve, which describes the steps people move through when they experience grief related to change. So what does that mean? Stories are about change, and the Five Commandments give us a language to talk about story structure, which mimics the way people metabolize change. Most stories open with the protagonist minding their own business when an inciting incident comes along and upsets the status quo. The inciting incident creates a desire and goal to arise within the mind of the protagonist. As they pursue the goal, obstacles and tools arise, which we call progressive complications. An unexpected event, or the turning point progressive complication, happens, forcing the protagonist into a dilemma, which we call the crisis question. The protagonist decides between the two options and acts on that decision in the climax. Then consequences flow from there in the resolution. So that’s how the Five Commandments of Storytelling work in your story. They also work in smaller units of story, including subplots, acts, sequences, and most important for our discussion today, scenes. Resolution often gets short shrift, as if it’s a mere formality tacked on to the end of a scene or story, with no real purpose. I hope what I share with you today will convince you that it’s not the case. Generally speaking, the Climax will answer, not only the Crisis Question, but also the question posed by the Inciting Incident. If it has not been answered, and is not meant to be an open question, like last week’s submission in the context of the climax, then the Resolution should clear it up. One thing the Resolution is not is summary of what’s come before: If the resolution restates what's just happened, it should illuminate the events, go deeper, and show us what it means. A new status quo, creating the setup or for the next scene, or even the inciting incident for the next scene (sometimes it’s difficult to separate them). You won't need to include each of these items in every scene Resolution, but it's good to consider the possibilities and whether you're getting the most meaning from your scene's last hurrah. Your scenes don’t exist in a vacuum and should connect to the Global Story spine. The resolution within a scene should make sense in light of the rest of the scene, but it should also be related to the Global Story Objects of Desire, or the protagonist’s needs and wants. Whatever unfolds after the POV character decides and acts should bring the protagonist closer to or further from that story-level goal. 1. What are the characters literally doing? There are two levels of story here. 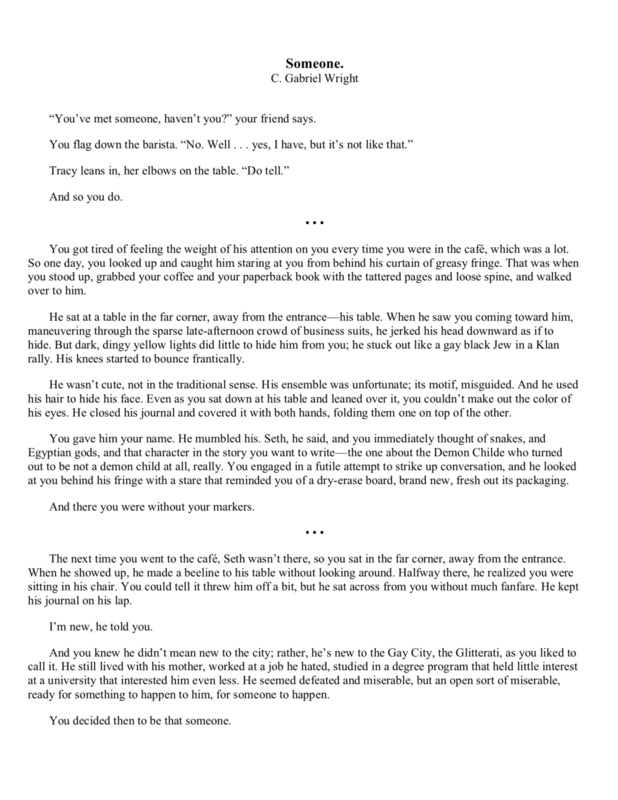 First, we have a framing story in which the narrator is talking to his friend in a cafe. That frame provides the context for the other level of the story, in which the narrator has met and begun dating someone. 2. What is the essence of what the characters are doing? Within the framing story, the narrator’s friend, Tracy, wants to hear about the narrator’s new love interest, and it’s not clear exactly what her reasons for that are, but she seems to be genuinely interested in her friend’s life. The narrator wants to tell Tracy about his love interest, probably because he’s excited and wants to share it with her. In the primary love story, the narrator wants to make a romantic connection with Seth, but he also seems to want to put Seth at ease. 3. What life value has changed for one or more characters in the scene? This is where we cast a wide net looking for almost anything that changes from the beginning to the end of the scene. The narrator goes from being a stranger to Seth to some level of knowing and understanding him. We might also say the narrator goes from being alone to dating someone. More specifically, the life value in a love story is a spectrum from love to hate, and here we could say the narrator moves from awareness (we get the impression the narrator has seen Seth at the cafe before) to attraction to dating. Dating is something less than commitment, and commitment is the primary positive result of a full courtship love story. We don’t get to that by the end of the submission (it requires proof of love act by both lovers), but we could easily imagine the narrator and Seth committing to each other in the future. From Seth’s perspective, we might say he was not known or understood in the beginning but is and feels understood by the end. With regard to the framing story, we might say that Tracy goes from in the dark to up to speed about the narrator’s new love interest. The narrator seems to be unaware of some aspect of Tracy’s privilege being one of several siblings, but becomes enlightened by the end. 4. Which life value is most relevant to the global or primary genre, the one that would go in a Story Grid spreadsheet? The love story value seems to be the most important: awareness to attraction to dating. 5. Story Event for Spreadsheet: This is a precise summary of what happens in the scene. I said, the narrator tells his friend about how he came to be dating Seth. 1. What is the inciting incident? The narrator catches Seth looking at him. 2. What are the progressive complications and turning point? Seth jerks his head down as if to hide. Tries to strike up a conversation, but it doesn’t work out. Seth is not there the next time the narrator goes to the cafe. 3. What is the crisis? Should the narrator “become that someone”? Is it a Best Bad Choice or Irreconcilable Goods Choice? As is often the case, it depends on how you look at it. 4. What is the climax? The climax decision is clear: The narrator decides to become that someone. But the action arising from the decision unfolds in an innovative way. 5. What is the resolution? I think the resolution is everything that follows that decision of the climax, but what’s interesting and innovative to me is that we see a kind of see-saw structure between climax action and resolution. Seth complains about the expense of clothes required to be part of the “Glitterati,”so the narrator shows him vintage shops and buys some clothes (climactic action), and Seth wears the shirt the next time they are together (resolution). Seth talks about the ridiculousness of heterosexual masculinity, so the narrator shows him a different side of it through kung fu movies and wrestling (climactic action), and Seth gains a deeper understanding (resolution). Seth tells the narrator about his home life with his mother, and the narrator listens and understands (climactic action). Then he can identify the color of Seth’s eyes, which had eluded him before (resolution). While on the roof of the cafe they look at the stars, and the conversation drifts toward life and death, which causes Seth to pull back (climactic action). Seth calls the narrator and leaves a sweet message about getting together again (resolution). Here’s my assessment of the framing story: The inciting incident is Tracy asking the narrator if he’s met someone. He hesitates and says it’s not like that, which to me signals there is something in the situation that will be difficult to explain to her. But he decides to try to explain (goal). Tracy reaches a conclusion about Seth’s life (“it’s sad” “why doesn’t he just get his own place?”) which is like a progressive complication, and the narrator realizes she probably can’t understand (turning point). He decides to lighten the mood. We don’t see what unfolds from there (it might appear in the rest of the story), but the resolution is implied, that Seth will continue to steer the subject away from Seth and his situation. Does it show the result of the life value shift? Yes, they were alone and now they are together. Does it set up a new status quo? Yes, both with Seth and Tracy. Does it demonstrate the characters' internal revelations, chief takeaways, or lessons learned? Yes, the narrator and Seth are learning to navigate their relationship, but also the narrator seems to learn more about what he can share with Tracy. So what does this mean for the scenes? What would be the next steps for this submission? My suggestions always depend on whether I’ve read the scene the way the writer intended. The meaning of a scene is often in the eye of the reader, and this one in particular could be read a couple of different ways. If I’ve read it incorrectly, the writer may want to consider if their intention is making it on to the page, but always remember that I’m not reading the entire story. No matter who is giving you feedback on your story, consider it, but balance it with what you know about your story. In terms of the structure, the story we have before us works as a scene and is well executed. It leaves me very curious to know what happens in the balance of the story. If I had to pick one suggestion, I might see about fleshing out the framing story. Are the narrator and Tracy in the same cafe where he meets Seth? What is the nature of their relationship? Any sense that they have been friends for a long time, or is she more of a casual acquaintance? Is he surprised by her inability to understand Seth’s position? What does this mean in terms of their relationship in the future, in terms of resolving that open question? Now all of these questions may be answered in the rest of the story, or in the end, Gabriel might decide that it’s unnecessary to add these details. These are just some questions that came to mind as I was reading the submission. You probably noticed that this is written in second person point of view, and I want to say a few words about that before we talk about resolutions. Anne Hawley and I talked about second person POV in episode 126 in the context of David Austin’s short story “All American.” Here, like in David’s story, second person is masquerading as first person, and used this way the narrator seems to be encouraging the reader to take a few steps in his shoes, so it’s a very close and deep POV. This is a choice that is rarely used and can be irritating to the reader, but I think it works really well here. If you’re considering this POV, I encourage you to check out episode 126, where Anne and I talk about the advantages and disadvantages of second person and offer questions to help you evaluate your choice. As you read or watch stories, identify the resolutions that unfold after a character decides and acts on their dilemmas. Which resolution purposes are met? Begin compiling a list of resolutions from the stories and scenes you read and watch to use as you plan, draft, and revise scenes for your stories. In the context of your own life, consider the resolutions you’ve experienced. Look at immediate and longer-range consequences of your the major decisions and actions of your life. How did you perceive the events initially? Did that change over time? Keep a list of your personal resolutions along with the your dilemmas, decisions, and actions from the crisis and climax missions. Then, as a regular exercise, write about them. Your reactions and emotions to the resolutions of life events can inform what your characters think, say, and do in analogous circumstances. And as I’ve said before, this is what’s really behind the advice to write what you know. I know this sounds like tedious work, but you’ll be amazed at how useful it is to have these examples to hand when you face writing dilemmas in your own stories. Do you want editorial missions sent directly to your inbox? Sign up to join us aboard the Writership Podcast! We'll send new episodes and editorial missions directly to your inbox so you'll never miss out. You'll also get the lowdown on our top 12 writing, editing, and self-publishing podcasts—perfect if you, like us, want to live a fulfilling life as a writer. We respect your privacy. Unsubscribe any time. The Writership Podcast is sponsored by our Patreon crew members—listeners like you who support the show and receive exclusive goodies as a thank you! Join our Patreon Crew to participate in our monthly Deep Scene Dive and Q&A calls to help you write better stories. © 2013 - 2018, Writership LLC. All rights reserved.